NEW! 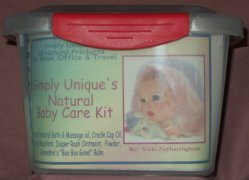 Essential Oil Emergency & Travel Kit! The contents of this basket normally sell for $67.00 if purchased individually. As a Manager's Special the basket sells for just $55.00. A savings value of $12.00. One of each of the items listed below in this Gift Basket for one low price. Packed in a reusable gift basket ready to use or give as a gift. Basket itself may vary depending upon availability. Made from a special formulated blend of cornstarch essential oil. Just the right touch of lavender is added to promote healthy skin, and to help prevent diaper rash and other skin irritations. A small amount is all that is needed to care for baby's skin. Made from our special blend of pure vegetable oils of, Cotton Seed, Soy Bean, Coconut, Palm Kernel, Extra Virgin Olive, and Sweet Almond, pure distilled water, sodium hydroxide, and pure Lavender Essential oil. This bar is a very mild blend and can be used as bath and shampoo bar for newborns including premature infants. Cradle cap can be a very annoying problem for babies. Simply rub a few drops of thisspecial blend of all natural oils into baby's scalp before or during a bath. You can leave itin, or wash it out. Just a few drops is all that is needed! Very gentle formula. Simply Unique Gifts has blended just the right touch of oils with Lavender essential oilsto soften and protect baby's skin Use very sparingly, as only a few drops will cover lots of territory on an infant's body. Use 2-3 drops in baby's bath. Rub into skin after baby is out of the bath. 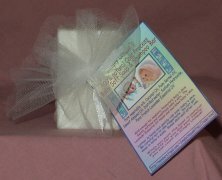 Simply Unique Gifts has blended just the right touch of base oils with Lavender essential oil to soften and protect baby's skin Use very sparingly, as only a few drops go a very long way. Use 2-3 drops in baby's bath. OR- Place a few drops in your hand and rub into skin after baby is out of the bath. Made for diaper rash and irritations. 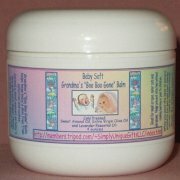 Protects and heals baby�s skin. Made from all natural. Sweet Almond, Extra Virgin Olive Oil, Bees Wax, and our special essential oil blend. Made from all natural Sweet Almond, Extra Virgin Olive Oil, Bees Wax, and our special Lavender essential oil blend. Safe for newborn infants. Use as a baby cream, for lip balm, or as a foot cream for dry feet. Softens scaly, dry elbows and knees too! Named by our grandson when he was only 2. He would get a scrape and come in for Grandma to put some ointment on it. As soon as it quit hurting he would come to show me and say, "Boo Boo Gone, Grandma!" He was so excited. Today, he is 5 years old and still wants Grandma's "Boo Boo Gone Balm" on any of his "Boo Boo's". Simply Unique recognizes the sites below. These days you can never be too safe. The need to know how to defend yourself is of utmost importance. Martial Arts is one way of learning how to defend yourself. There are many reasons to learn martial arts, the physical & mental conditioning, weight loss, or just for the fun of it! Need Fresh, Hand-Picked Mistletoe for the Holidays? Simply Unique Gifts can take care of that! Simply Unique Gifts takes payments from Pay Pal. Your bank, or no bank, no problem! You can send payment through Pay Pal! Check them out! You'll be glad you did! Holiday Pine Cones, Ready to hang on the Christmas Tree! Multi-Sized Patterns, 8 sizes from Small Preemie to 12 Months! Spider Webs Permanently Mounted on Rocks! Unusual and Great Gift! Lavender Essential Oil is the only oil we carry at this time that is recommended to use with infants under 3 months of age. Bells & Whistles A wonderful site with lots of help for making Web Pages. These guys have their heads on straight! Although the photographs of the products are provided by Simply Unique.